Hi folks! If you’re anything like me, then you always want to run before you can walk. You’re the “I got this,” guy. And if you’re anything like me, you have also suffered the consequences of over confidence. When it was my turn to go out on the water, I made it up the wake. That wasn’t the problem… I just never learned how to land. The crash was spectacular! Body one way, board the other… The same thing happened when I saw my first flip turn during a friend’s swim meet. “I can do that. No problem,” I said. The easiest way to get started on the road to a better flip turn is getting the flip part down. I recommend practicing your flip a few times in a part of the pool where you won’t hit anyone or anything…like a wall. When you flip, you want to start by floating on your belly with an arm out. Then tuck your chin and bring your arm down. This should flip you around onto your back looking up. Don’t feel bad if you get water attacked the first few times you try this. It happens to the best of us. Try blowing out your air as you do the flip. That should keep you from trying to be a fish. Now you are the master of the flip! Great… now comes the shove off. Once you have completed your flip, you will be close to the wall facing up. Keeping your knee bent, you’re going to jump off the wall straight up so that you glide under the water. It is really important to put your arms up and your hands together so you are as streamlined as possible. Just like the flip, be sure to practice the push off a few times all by itself. Get the feel of the push and how to approach the wall. Alright, last but not least, let’s put it all together! 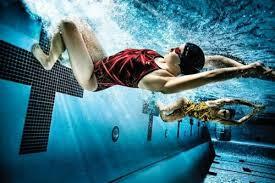 Swim down your lane and when you get close to the wall, flip! Then, shove off and glide to the surface to continue the way you came. Don’t worry about when to start the flip. Look on the bottom of the pool as you’re swimming. There are lines and when they end you are close to the wall. Now, it’s just a matter of getting used to the timing and how fast you move. Take time to practice. 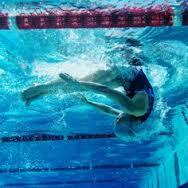 Don’t just jump into the flip turn or you will end up with at least one headache or sore foot from the wall. I know… believe me… I know! 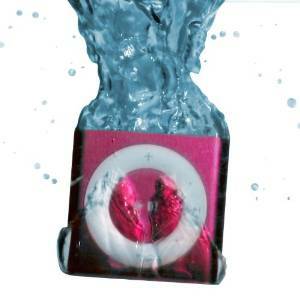 And if you forget any of this, you can always download instructions onto your Underwater Audio Waterproof iPod Shuffle so that you can get guidance on the spot. If you have any comments or questions, please leave them in the section below. Until next time, swim fast and have fun!